CERN scientist Sergey Antipov, an alumnus of the Fermilab Accelerator Ph.D. program, completed his 2017 doctoral thesis based on research he completed at Fermilab, specifically on circular high-intensity particle accelerators. His excellent work has earned him the 2018 Outstanding Doctoral Thesis Research in Beam Physics Award from the American Physical Society Division of the Physics of Beams. The award will be presented to Antipov at the 2018 International Particle Accelerator Conference, where he will give a talk on his thesis research at the Louis Costrell Awards Session. The annual award consists of $2,500, a certificate and travel reimbursement. Antipov wrote his thesis, titled “Fast Transverse Beam Instability Caused by Electron Cloud Trapped in Combined Function Magnets,” as a student at the University of Chicago under supervisor Sergei Nagaitsev, Fermilab chief accelerator officer, and Young-Kee Kim, professor at the University of Chicago. His thesis explains the nature of the fast-beam instability observed in the Recycler and produces estimates for the planned intensity upgrade. Antipov became interested in particle accelerators when visiting Fermilab as a summer student in the Helen Edwards (formerly PARTI) summer internship program in 2011. 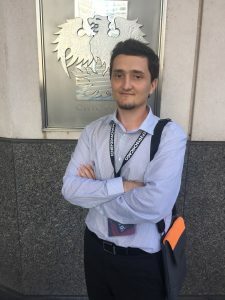 After completing his master’s degree in applied physics and mathematics at Moscow Institute of Physics and Technology in Moscow, Russia, in 2012, he moved to Chicago to pursue his Ph.D. at the University of Chicago. After receiving his Ph.D. in 2017, Antipov became a fellow at CERN. He is currently working on collective beam stability aspects of the future upgrade of the Large Hadron Collider. The Joint University-Fermilab Doctoral Program was established in 1985 as a way to encourage students to pursue a career in accelerator physics and technology by providing research opportunities using facilities and expertise available at Fermilab. Fermilab scientist Bob Zwaska currently manages the program, which works in a joint agreement with universities. Fermilab reimburses the university for the student’s salary and provides the research project and supervisors, while the student maintains a relationship with their home institution’s advisors, who oversee the student’s progress toward his or Ph.D.